Premack's Principle suggests that if a student wants to perform a given activity, the student will perform a less desirable activity to get at the more desirable activity. Many people grow up under a rigorous application of the principle. Parents around the world tell kids to “finish your homework before you play outside”, and “finish your vegetables* before you eat desert”. Did you ever wonder if the “no pain, no gain” line of thought drilled into us since grade school allows for a high level of friction in software? Users are willing to accept pain, and creators subliminally dish it out. This is my theory: we allow business software to have high levels of friction because employees are predisposed to slog through undesirable activities inside software to get a job “done”, or just get paid (a highly desirable activity). Thus, with limited resources, business will always favor features over usability. 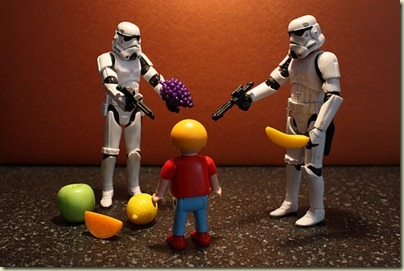 * The discerning reader will notice that the Imperial Stormtroopers featured in the picture are bearing fruit - not vegetables. However, section 4 of the artistic license granted to me as the owner of this blog includes a clause that allows pictures of Imperial Stormtrooper action figures to appear in any post, even when it risks creating cognitive dissonance. Pictures of Jar Jar Binks are still strictly prohibited. The placement of the fruit is a little disturbing. Seems that one stormtrooper is rather excited. Unfortunately, I think you are right... Features show up on a list, usability is a concept (perhaps an abstract one, even) that you cannot use to justify cost to a higher-up manager. Why spend $5000 extra to make an application easier to use, when our people (1) are not dumbasses and (2) have to work to earn their money? Unless perhaps you can disguise usability as a set of features (or performance improvers), but even then it may still come up after other, more visible features. Features over usability - how else to explain the development (sic) of Microsoft Word over the years? That ribbon had to come from somewhere! This argument goes way if developer focuses on delivering value, which is a function of features and usability, to a different degree. I disagree. It's not like students make up homework to do before playing outside, and they don't ask for vegetables if not given any before having dessert.